123Greetings / Help Home / Address Book / How do I add contacts to my Address Book? - Go to My Address Book tab, on the right hand side you will see “Add Contacts” form. - Simply, enter the details of the contacts and click on “Add” button. If you have used the same machine to send ecards in the past, you might have some contacts in your system cookies. You can import those contacts by following these instructions. - In card sending page you will get an option “N contacts were found in your computer. Would you like to import and save contacts permanently on 123Greetings Address Book?” just above the Address Book as shown below. - Click on import and save contacts link and all your contacts will get imported to Address Book. You can import contacts from other websites like Yahoo! Mail, Gmail, and Hotmail etc. To find out how to import, click here. - Go to My Address Book tab and click the ( ) icon present in the “Import Contacts” box located in right hand side of the page. - Click “Browse” button and select the .CSV file to be imported and click “Upload”. - Select the contacts that you want to import. If you want to import all then click on “Check All” option. - Once all the contacts are imported a friend request will be sent to them. Click here to find out how to create a .CSV file. e. Whenever an ecard is sent from 123Greetings.com, the Address Book will automatically store the name and email address of the receiver if the email address is not in your Address Book. Next time when you visit our website to send ecards, the contact details of the receivers will be displayed in the Address Book. 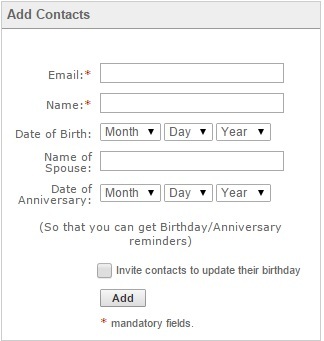 Note: Whenever you add a contact to your Address Book, we send an invitation to your contact to join you on Connect if you select the option “Invite contacts to update their birthday”. Also note that as per COPPA (Children's Online Privacy Protection Act) you may only add contacts who are over 13 years of age. How do I edit or delete contact information in my Address Book? How do I import contacts from Yahoo! Mail, Gmail, Hotmail etc?